Tender tail-on Shrimp coated in buttery panko breadcrumbs. The hardest part about making Butterfly Shrimp is not making enough. Perfect for big parties and big appetites, they are always a great choice when you’re looking for an extra crunchy, extra delicious meal or snack to satisfy the crowd. UNCOOKED. KEEP FROZEN UNTIL READY TO COOK. Remove shrimp from packaging before cooking. 3. Bake 14-18 minutes total* Flip after 10 minutes. 1. Place shrimp in basket, separating to prevent from sticking. 2. Fry at 350ºF for 2 to 3 minutes. Note: The correct oil temperature is critical to ensure proper browning and thorough cooking. Always allow oil to reheat before frying additional shrimp. 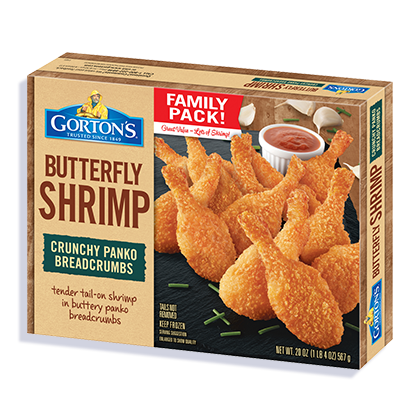 INGREDIENTS: Shrimp, breadcrumb coating, vegetable oil. Shrimp, sodium di-, tri, and polyphosphate (to retain moisture), sodium bisulfite (preservative). Wheat flour, water, modified corn starch, yellow corn flour, sugar, salt, whey, romano cheese (milk, culture, salt, enzymes), butter (cream, salt), baking powder (baking soda, sodium aluminum phosphate), nonfat milk, yeast, natural flavor. Not a significant source of vitamin A, vitamin C and Iron.